This week I have not bought any new fabric. I have continued to work on finishing the binding on starry log cabin. I completed the center of courthouse steps. I drug out my scrap bin. What a disaster. 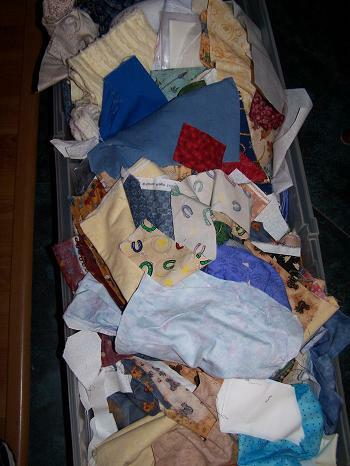 I began sifting through this mess and pulled out everthing fat quarter size & larger, and am moving it back to the fabric shelves in my fabric closet. The rest, I am starting to cut down into sizes recommended by Bonnie Hunter. I am trying to do the leaders/enders thing she has on her site. 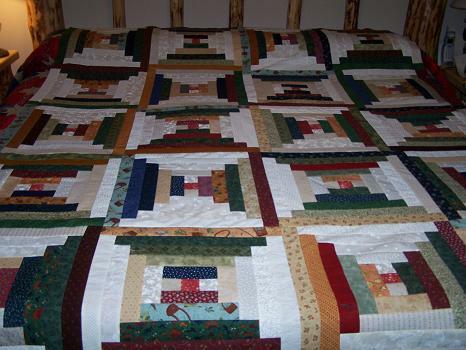 I hope to end up with an Oklahoma Backroads quilt one of these days from doing this. I’ve seen Wendy make a beautiful quilt with her leaders & enders. Maybe I can do it, too. Here is my start at cutting this fabric up, and my first leaders/enders. Here is the cutting pile. Will I have the fortitude to stick it out? Now then, if you are reading this post on a site called Ester’s Sewing Blog, you are reading stolen information that has been copied and posted without my permission! Yes, I have now been added to the list of blog scraping or blog plagiarism victims. So have several of you. Be sure to check your incoming links. Randi, I love your courthouse steps. I have been doing some stash busting myself. Now how do I check my incoming links and how do I get that copyright box put in. I tried but it didn’t work. Thanks. Love the quilts and yes, you can do it, cut that fabric. 🙂 Blog scraping/blog plagiarism is terrible and getting worse. The quilts look great, as always. Good for you dealing with your scraps..I should but probably won’t :(. And what’s this blog scraping?? I love this quilt, great job! Scraps, kinda like taxes something we must deal with (lol)…. 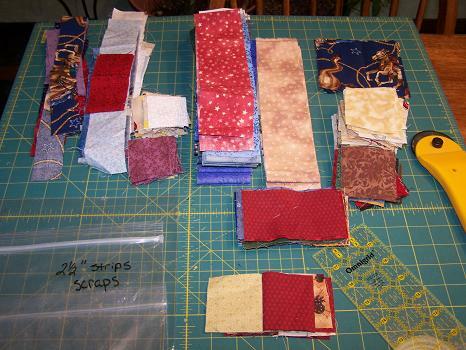 And I bought a little fabric this week, just a little…. Oh mY goodness! I noticed that I too, am on Ester’s Sewing blog. I do not understand this? Randi – my guild had Bonnie Hunter for a program in October – she is just fantastic! And she gives a good massage, too. SC is sad she is moving up the road to NC. Your courthouse steps look wonderful. So does the pumpkin bread. Blog scraping? Got to go check that out. How did you find out? Ooooo, I’m so impressed! You’re using up all those scraps and haven’t bought any fabric this week. You’ve got nerves of steel, Randi. : ) The Courthouse Steps looks great. I hope you put it out where friends can enjoy it when they come to your home. Love the courthouse steps, Randi! I really like a scrap quilt. Can’t wait to see it quilted! 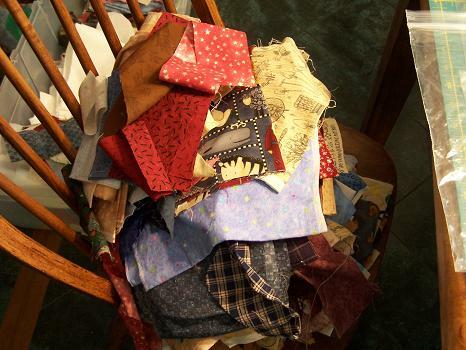 thank You for the ideas on scrap busting AND the link to quiltsville. I have been trying to make sense out of my scraps now I have a method. What about this Ester Sewing blog? I am kinda new to blogging how do we prevent this? I really don’t know how to prevent the blog scraping, or if you really can. I so don’t understand all of it, either, and first read about it on Carla’s blog. She is in my blogroll under Feathered Fibers. You can also go to http://www.plagiarismtoday.com/ This guy has lots of info and advice. Got that link from Carla’s blog, too. Are you joining Bonnie’s Cross Road mystery? Sounds like you have all it takes: lots of stash. Your courthouse steps have inspired me to use up more of my stash! So much fabric, so little time!